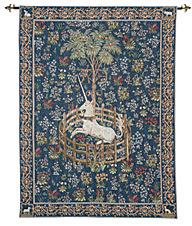 Classic Tapestries has many beautiful Belgium designs available. Not all are available for viewing on the website. We welcome enquiries. Please contact us for further designs. 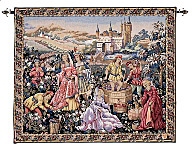 Silk-screened late 15th century mille-fleurs tapestry from Flanders. 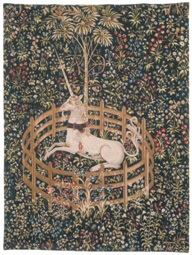 Now on display at the Metropolitan Museum, New York. 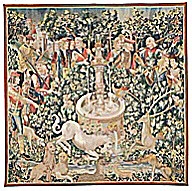 A 16th century scene showing noblemen in a forest clearing. Loom woven. 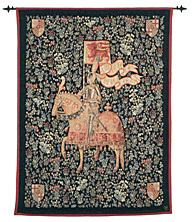 Woven late 16th Century in Grammont,Flanders in the then new style of "greeneries with large leaves" Silk-screened. 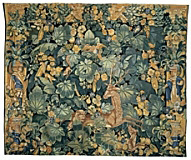 16th Century tapestry from Audenarde, Flanders with birds and large aristolochia leaves. Silk-screened. 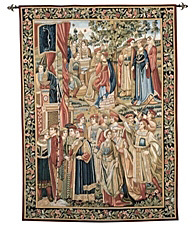 Hand woven tapestry, originally woven in Brussels around 1515 showing the arrival of the Court Procession, enriched by a magnificent border. Hand woven. 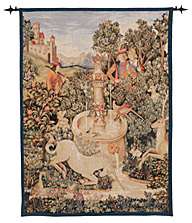 Reproduction of a late 15th century tapestry which now hangs in the Metropolitan Museum in New York. 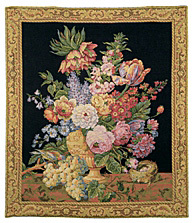 Loom woven. 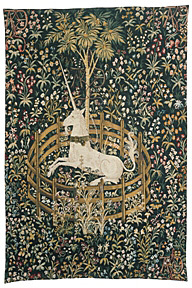 A late 15th century mille-fleur tapestry originally woven for royalty, featuring a scroll border. Note : Size 3 has a different border. Loom woven. 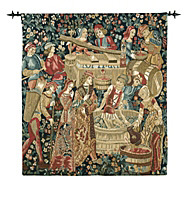 Reproduction of a 15th century tapestry showing the pressing of the grapes, watched by a nobleman and Lady. Loom woven. 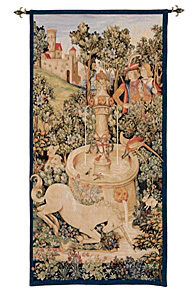 From a tapestry originally woven at Tournai around 1470, showing the month of June. Loom woven. 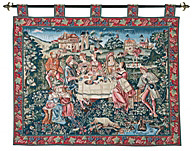 A tapestry showing a banquet in medieval times. Loom woven. 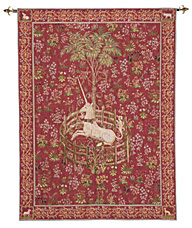 The Unicorn tapestries were woven in the late 15th century in Flanders. Loom woven.